Oconee County is going forward with the process of identifying and selecting farms for a farmland protection program even though there is no federal money to make the program work. The local office of the United States Department of Agriculture, which administers the federal program, in July turned back $175,000 in federal funds that were available to the county for farmland protection this year, saying that the county “opted not to put a farm forward” for 2013 funding. The federal Farm Bill, which historically has included funding for farmland protection, is stalled in Congress. Even if it were to pass, funding is likely to be delayed for at least a year. The county has notified farmers that they have until Oct. 31 to submit an application for funds from the program, but the county historically has funded only about 25 percent of the costs, with the federal government contributing half and the owner contributing 25 percent. At present, no one in the county is taking responsibility for having made the decision not to put a farm forward this year so the county could obtain the $175,000 that was available to it for the farmland program. Oconee County Board of Commissioners Chairman Melvin Davis told me emphatically in an interview I did with him in his office on Sept. 3 that he did not tell the USDA to turn in the $175,000, and he said he doesn’t believe anyone in the county did that. “It has never come to the Board (of Commissioners) that a farm was available,” he said. Davis said he believes that someone at the USDA at or at the Athens Land Trust, which has partnered with the county on the program, made the decision not to go forward with a nomination this year because it did not have a farm ready for approval by the BOC. 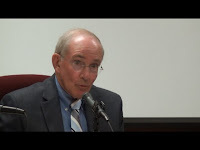 Sharon Holbrooks from USDA had reminded Davis in an email message two weeks before I interviewed him--on Aug. 21--that the USDA responds to nominations of farms by the county and does not bring farms to the county for approval. Correspondence from Laura Hall of the Athens Land Trust, shared with me by Russ Page, indicates the Land Trust was ready to put a farm forward for this year’s federal funding as soon as Oconee County indicated it would contribute its part. Page has worked closely with the Athens Land Trust since 1998 on the county’s farmland protection program. Page told the Oconee County Citizen Advisory Committee on Land Use and Transportation Planning at its meeting last month that he had 23 farms on his list of those interested in participating in the farmland protection program. Holbrooks, conservation easement specialist with the Athens office of the Natural Resources Conservation Service (NRCS), met with the BOC for 70 minutes on April 23 to explain to the Commissioners how the federal Farm and Ranchlands Protection Program (FRPP) works. Since 2003 the county has protected seven farms totaling 485 acres, using FRPP, state, county and other local funds. In each case, the county has partnered with the Athens Land Trust, which took easements on the land to keep it out of development. The farmer donated a quarter of the value of the easement, and the federal, state and local funds compensated the farmer for the remaining value of the easement. In the past, the county has relied on a citizen group, called the Oconee Partnership for Farmland Protection, to solicit and screen farms in collaboration with the Athens Land Trust and following the federal criteria for farmland selection. In January, the Commission, largely at the urging of Commissioner John Daniell, opted to play a more prominent role and has set up its own committee to screen farms. The county itself is now soliciting farmers to nominate their farm for consideration. At that April 23 meeting, Holbrooks told the BOC that she expected to have $175,000 available to Oconee County for funding out of this federal budget, which expires tomorrow. She told the Commissioners she had just gotten the 2013 funding, requiring “a pretty fast turnaround for FY13 if we want to have those funds available.” She was not more specific on the deadline. Holbrooks also met with Davis and Commissioner Mark Saxon in an invitation-only meeting on May 22 to discuss the farmland program. “Oconee County opted not to put a farm forward” for 2013 funding, Holbrooks told me in a telephone conversation on July 24. Holbrooks told me in a telephone conversation on Aug. 5 that she learned of the decision by the county not to nominate a farm through “subsequent meetings” but would not elaborate. Saxon is the only other county official who attended the May 22 meeting. He has refused to meet with me to talk about farmland protection, telling me repeatedly that he is too busy. The most recent response from Saxon was in an email message he sent me on Sept. 16, in which he wrote that he would “call me soon.” I followed that with another request four days later, which he has not answered. Gerald Grace in the NRCS office in Watkinsville on Aug. 12 sent BOC Chairman Davis an email message telling him that funds for the FRPP were no longer available to the county. The next day, Davis wrote back to Grace saying that he was “sorry those applications on file cannot be used” to obtain the Fiscal Year 2013 funds. Davis copied that message to Holbrooks, who wrote back the next day, saying she had sent back the Fiscal Year 2013 funds in July. I obtained copies of these email message through an open records request. The county said it took two hours to do the search and retrieval and charged me $40.67. He said that he suggested the NRCS set the application deadline for FY 14 funds, obtain those applications, and then forward them to the county’s new ranking committee. “I believe that there still is some misunderstanding about each entities (grammatical error in original) role,” Holbrooks wrote. Oconee County solicits the applications from farmers, she said, and then forwards them to the NRCS when funding is available. Holbrooks’ email was copied to the other Commissioners, and Commissioner Daniell sent Holbrooks and Davis a note on Aug. 21 saying he understood that NRCS is not responsible for seeking applications. Holbrooks did not respond, based on the documents I received from my open records request. Both the U.S. Senate and House have passed a version of what is called the Farm Bill, but it has not even gone to conference committee because of radical differences in the legislative approaches of the two houses. Both bills eliminated the FRPP and related programs, consolidating 23 programs into 13. According to an analysis of the two bills by the National Farmers Union, however, the bills make no overall changes in the existing Farm Bill on conservation, meaning funding for some type of farmland protection program will be included if Congress passes either of these bills. Holbrooks had anticipated this change in the name of FRPP when she met with the Commissioners in April. Despite the importance of the Farm Bill, Congress is dealing with more pressing issues as the fiscal year comes to a close at midnight tomorrow night. BOC Chairman Davis reminded the Commissioners at their meetings on June 4 and again on July 30 that the county depends primarily on federal funds to make its farmland protection program work. The video clip below is from the July 30 meeting. The 2009 Special Purpose Local Option Sales Tax earmarked $500,000 for the county’s part of the program. The county currently is planning for its next SPLOST vote, in June or July of next year. The lack of federal funding would make it easy for the Commissioners, who must decide on such matters, to take farmland protection out of the ballot language next summer. The Board is interested in development. They don't buy into farmland protection and so they don't act on it, without being honest and saying so.